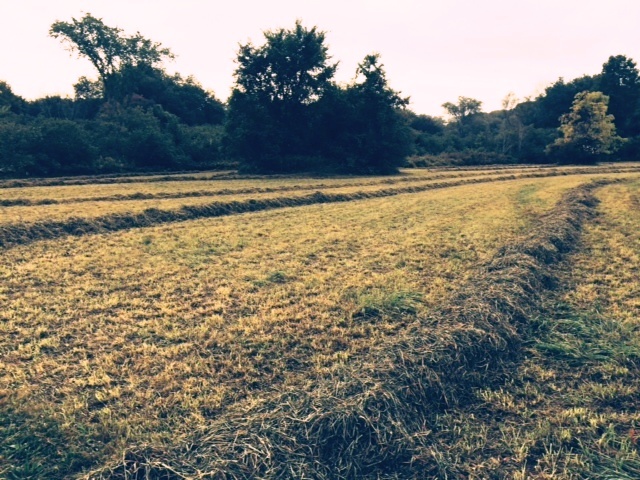 An old dairy farmer used to make hay in the fields at the end of our street, but now that farm, too, has been sold. When I saw the timothy grow high in this dry summer, I worried: won’t it go to waste? It didn’t. Someone else baled it though I never discovered who, and I had that farmer’s daughter’s feeling of relief. The work got done. That important work that helps sustain us all through the long winters of New England. The second cutting of that field usually comes in late August when the alfalfa produces its flowers. Something about that lush field must appeal to finches because a flock of them flies up from the grass when I pass by on my morning walks. Yellow, yellow, yellow from such a deep green, such vibrant dots of purple. This year, however, the flowers died, the finches left, and still the field was unmowed. Cows like timothy. They shove it around with their muzzles and yank some strands on which to ruminate, other pieces they leave behind the way my kids pick onions out of whatever they’re eating. But when you shake out a biscuit of alfalfa before cattle, the coarse strands scratching your forearms, prickling your wrists, the animals are all business. No evidence of alfalfa ever needs to be swept away once the animals have finished. They lick their troughs clean, and then, they milk like crazy. Young stock never tastes this delicacy. You have to be a working girl to get that kind of a treat. So to pass this field those final days of summer, these first two weeks of fall, disturbed me. It also challenged me to remember: that’s not your life now. That field, the hayloft that still has room somewhere, all the bales that will not thrill some poor old dame missing her fresh pasture in the darkest days of winter, isn’t your concern anymore. Try to console yourself, instead, with the joy of those finches. But one day when I was off at my job in the life I lead now where no one is dependent upon a good harvest, the field got mowed. Sometimes, I remember this well, things get done a little later than you had hoped. I had a busy day Friday and an upsetting one. A day that reminded me how cruel young girls can be and how, no matter how painful your own adolescence might have been, that feeling cannot compare to the agony it is to watch your own children muddle through it. I needed a walk, anticipated the healing way moving my body clears my head, and it did feel good to be outside. The Concord grapes are ripe and emit their perfume. Treetops are turning orange, their clingy vines a jewelly gold. When I passed the field, however, all I could smell was the hay. To think about our farm, its ramshackle barns, the batting heads of our cows at their feeders, my father in his good weather footwear, black hightop Converse sneakers, strekking through the empty heifer barns towards where we parked the corn chopper is one kind of longing. But to come upon a freshly mowed field of alfalfa is a much more potent trigger. I didn’t think of home again, I was home. Because he baled hay late into the day and rushed home to milk before unloading the wagon, my father often parked the load outside my bedroom window. In dry weather, he left it overnight for the hired help to empty. If the forecast predicted rain, he emptied it himself after milking. Either way, I slept inhaling that scent. I’m sure a part of me thought that’s how I would always fall asleep. Outside, the stanchions would creak, the dogs bark at a raccoon in the cornfield, a calf would call out for its mother. Wasn’t there only one world to be a part of? And wouldn’t my father always be central to it? Decades later, I stood on a street in a town that is far away from where our farm used to be, but that scent placed me squarely back in the hayloft, in the freestall where we fed the cows, in the bedroom of a house that was burned down long ago to make room for something else. I’m happy the bounty of that field will not go to waste, and next year, I can feel confident that eventually, someone will do the work that needs to be done. But that relief will not completely lessen the homesickness I experience when the field is not grass but crop, when I am reminded once more that there are some places to which we can never really return. Maybe, for my daughters working through teenage strife, for me witnessing it, for anyone struggling along the unavoidable path before them, that’s also the good news.